According to the often-told story, having seen George Gershwin's mini-opera Blue Monday, bandleader Paul Whiteman asked the composer for an extended work to perform at a special concert to be given at the Aeolian Hall in New York. Gershwin agreed and then, in the rush of his career, forgot about it. With roughly five weeks left before the concert, brother Ira read a newspaper article promoting the Whiteman venture with the promise of a "Berlin syncopated tone poem," a Victor Herbert suite, and a "Gershwin concerto." Ira promptly informed George, then in the middle of tryouts for a new musical. George swung into (belated) action. Still, he was handing pages to the orchestrator days before the concert and hadn't completed all of the solo part by the time of the performance. These sections he improvised, nodding to Whiteman to give the next downbeat at the appropriate time. In a program that up to that point had been pretty much of a yawn, the Rhapsody became the unqualified hit it has remained to our own day. It has been arranged to a fare-thee-well and received well over 200 recordings, and its big broad tune toward the end has been used for such things as ring tones and commercials. Incidentally, the Berlin tone poem never materialized. For a long time, critics loved to dump on Gershwin or condescend to him as naïve and untutored. His defenders tended to come from the theater, rather than from the conservatory, although many major composers, including Schoenberg and Ravel, admired his music. Recently, Gershwin's stock has begun to rise, along with research activity within the academy. After all, Gershwin's concert music has occupied a repertory niche long after more esteemed works of the moment have disappeared. Though I'm not a big fan of the box populi argument, I nevertheless think that staying power indicates at least some inherent value. Furthermore, Rhapsody in Blue (brilliant title supplied by Ira after seeing an exhibition of paintings by Whistler) has stood as somewhat of an exception in the critical mud flung the composer's way. Writers at the time of the premiere hailed the Rhapsody for spurious reasons. Some claimed it as the first work to combine jazz and the concert hall ("Gershwin made a lady out of jazz"), when it wasn't, by a long shot. We had already had pieces by Debussy, Stravinsky, Ives, Milhaud, and others. However, it was the piece which made the greatest impact by far and spurred many composers both in the Americas and in Europe to experiment with incorporating jazz elements into Modern concert music. Others claimed that Gershwin wrote jazz – also not correct. Of course, jazz had an extremely fluid definition in its early years. Over the years, however, this last claim and its debunking insidiously mixed with American race problems. Some accused Gershwin of some sort of intellectual theft of black culture. This charge makes no more sense than accusing Duke Ellington of stealing French culture from Debussy and Ravel or Western European music from every composer since Monteverdi. In art, material may be proprietary, but ideas and styles are not. To say that Ellington and Gershwin sound alike (which has to be the phenomenal basis behind the accusation) is obvious nonsense. 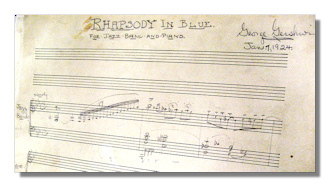 Also, Rhapsody in Blue precedes the earliest known jazz extended composition. Finally, the odd notion persisted that Gershwin simply didn't know what he was doing. He studied music only haphazardly, when it suited his schedule. Yet, many passages in his music point to his learning at least something of classical procedures. Study, and hard, Gershwin did with a number of teachers including Henry Cowell and, most extensively, with Joseph Schillinger, a pedagogue who had constructed a "mathematical" (not really) system of composition. Most of the adverse criticism stems from the fact that Gershwin never wrote a sonata movement, as if that were the way to bind a piece together that established a composer's bona fides. A remark from Henry Cowell about his teaching Gershwin counterpoint I find illuminating. Gershwin got bored with strict counterpoint and would alter things to get in a piquant harmony. In short, he treated classical procedures as means, rather than as ends, just like most other Modern composers. When talking about the Rhapsody, we must ask, which Rhapsody? The premiere version, of course, with its improvised passages, is irretrievably lost. This leaves us with the published original for piano and the Whiteman dance band or the symphonic version, both orchestrated by Whiteman arranger Ferde Grofé. The dance-band incarnation has enjoyed a relatively recent renewed interest after years of the symphonic arrangement crowding it out. I like both but tend to think of each as its own unique thing. As I say, the main criticism against Gershwin runs that the piece is less a coherent composition than a chain of one great tune after another. Bernstein probably came up with the most widely-known and devastating version of this, contending that you could cut out whole sections and still have the Rhapsody in Blue. I'm not so sure. I can whistle to myself from memory a large chunk of the score from its opening measures, which indicates to me that somehow the piece coheres better than Bernstein claims. Furthermore, Gershwin clearly marks the piece a rhapsody, a form which shouldn't lead us to expect iron musical logic. And is one great tune after another a bug or a feature? At any rate, I hope to show that the Rhapsody isn't a random ramble, but a journey taken with a small set of themes. 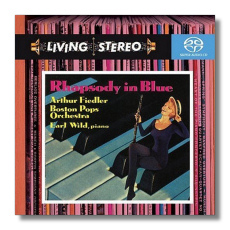 For timings of various sections, I will be using the classic Arthur Fiedler RCA recording with Earl Wild and the Boston Pops (61393), a benchmark account ever since it came out (relatively inexpensive as well) and my introduction to the piece at age 13. I use the symphonic rather than the dance-band version, since I believe more people know it. I fell in love with the symphonic Rhapsody immediately and haven't fallen out yet, more than fifty years later. I don't call this performance the best recording of the Rhapsody I've heard (please don't ask me what that is: there are too many that I like and I doubt I've heard even a quarter of those available). The disc also contains front-rank accounts from the same forces of the Concerto in F, An American in Paris, and the Variations on "I Got Rhythm", so it's a bargain. 00:00 – A trill and an upward smear of notes from the solo clarinet leads to the main theme. Incidentally, Gershwin, a pianist, had originally written out each individual note of an upward run, since the individual piano keys prevent a player from producing that effect on the instrument. The Whiteman clarinetist, Russ Gorman, was fooling around with his solo during rehearsal and came out with the smear. Gershwin heard it and told him to keep it in – a smart decision, since it grabs the listener by the ears and has immediately identified the piece ever after. 00:29 – closing idea featuring repeated notes, a "blue" seventh, and a "blue" third. 03:31 – A "Latin" number in the orchestra, led by solo trumpet and characterized by repeated notes. The repeated notes turn into a transition using the closing motive from the Introduction (03:55) and a full statement of that idea with extension (04:08). 04:49 – Led by a pentatonic fragment, the orchestra strikes up a blues-y march, complete with banjo keeping time. The march transforms into a speeding train (an inspiration for the piece, incidentally) and segues into a meditation from the piano solo on the closing motive (06:03). A haunting solo horn joins in briefly at 06:45. 07:35 – This time it's the piano's turn to ruminate on the announcement, followed by mainly the solo winds of the orchestra in a humorous, off-kilter treatment, and the blues march for solo piano (08:41). Elements of the "Latin" episode enter, as well as a virtuoso passage involving syncopated octaves in the left hand. 10:35)– After a brief transition, Gershwin comes up with a genius theme that lifts the piece to a new level, doubly effective because totally unexpected. This theme has had a considerable life outside the Rhapsody itself. Paul Whiteman used it as his band's musical signature. United Air Lines continues to identify its brand with it. People have called the tune "Tchaikovskian," not for any technical reason that I can see, but because of its gorgeous singing quality. It builds in the orchestra, before the piano takes over (12:36 ). 14:25 – The orchestra takes up the broad tune, this time in the guise of a "snappy number." It builds to a climax on a sharp dissonance (14:52). The piano then begins another climax on the blue-note riff (14:57). (15:18) – The music reaches a climax – and how! – with the apotheosis of the repeated-note motive of the opening. The announcement comes roaring back in the full orchestra (15:47), and the piece ends grandly on the blue-note riff. As we can hear, Gershwin has created mainly "open-ended" ideas – that is, ideas which can be joined together at either end. A "closing" one time can become an "opening" another. This allows him to recombine his thoughts in many different ways. Furthermore, there really aren't that many of these basic pieces. It's Gershwin's art that renews and transforms them in changing contexts. As far as the large pieces of the score are concerned, they're fairly clear, rather than a jumble. Is it a "perfect piece" architecturally? Not even a rabid fan like me can claim that. The Latin episodes especially seem tacked on. On the other hand, I wouldn't want them gone. Like the most livable cities, the score hasn't been planned to within an inch of its life. It still allows you to come across odd byways. It rambles, in the best sense. More than that, it has become the musical icon of the big American city, with its nervousness and its openness and sense of optimistic striving. I can't think of any other work that comes close.